T4 is dino, t6 is synthetic. Oreilly has a sale on Chevron delo synthetic. Also a rebate. 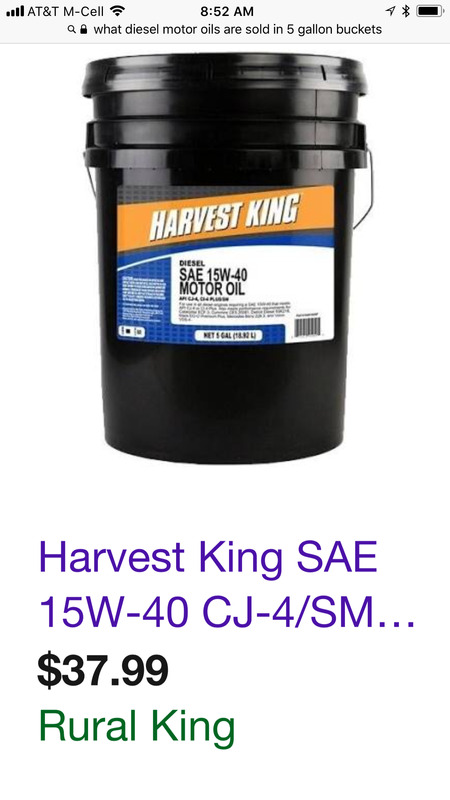 Is anyone using the Harvest King motor oil sold at Rural King? On a search (another site) a thread came up that the user called Blacstone and talked to a tech who said the Harvest King was as good as any other diesel oil if scheduled maintenance (oil changes) is performed. Not sure what the other brands of oil cost cause I only use Rotella T6 (synthetic). They're offering a mail in rebate until the end of the year, $7/gallon, $35/5 gallon pail. I think I've got 4 oil changes worth in my garage already, LOL! Look for it on sale too. Often is. How often are you changing your synthetic? I was considering synthetic where I would just change my oil, oil filter, fuel filter every 10K. Is anyone else doing this. My truck is pretty pampered, no heavy towing yet, not running up many miles. How important is the “date of oil change” because right now I have exceeded the date of sticker (oil change) but still have 1800 miles or so left before reaching max mileage. The P.O. had the oil changed before I bought the truck in June 18 - sticker says Chevron products but doesn’t list actual oil but is hand written that it was 10w30? Not sure about the oil but it is listed on Ford's approved WSS-M2C171-F1 diesel oil list. I have always gone 7500 to 10,000 with all my vehicles. '98 Camry, '97 pathfinder, 2000 7.3, with synthetics but after moving to the lower desert I'm going 5000. A big diesel shop here in Phoenix recently posted a 720,000 mile 7.3 coming in for general maintenance with original engine. He does oil every 5000 and fuel filter every 10,000. At the risk of starting an oil war let me start by writing that I recognize that oil selection loyalty is common and feelings run strong. Here is the reality, it is much more about branding than about the actual oil itself. For instance Refiners like Shell and Chevron make great oils, but they, or others with license, often package that same oil in other brandings. Regardless of branding the oil is made to an API specification and it will have an API spec on the container. I use Rotella T, now T4 because it's good oil and available almost anywhere. Rated API Spec out to the latest spec which includes all the previous specs. So, just get an oil that meets or exceeds the API spec recommendation for your engine. Just look right there on the container for it. Regardless of where you buy it if it meets the API spec you are good to go and chances are it actually originated from the same refiner. I did not realize my Delvac was made by the same refiner as my Shell Rotella and Chevron DELO but even if it were, you omitted the fact that quality oil is largely dependent on the choice of base stocks and proprietary additive packages. It is my understanding that the Blending & Filling facility is where the various brands might have common origins but each went through at a different time than its competitors to achieve its desired properties. A blind VOA will typically be unique enough for a tribologist to identify the brand & type. I am not saying one is necessarily superior to another and I am not defending any particular brand loyalty, but they are not all the same with only a different color container. Last edited by ArcticDriver; 10-02-2018 at 08:10 PM. I did not realize my Delvac was made by the same refiner as my Shell Rotella and Chevron DELO but even if it were, you omitted the fact that quality oil is largely dependent on base stocks and additive package. Motor oil is like beer...they are not all the same. Try a few out and see which one your engine likes best. There is really no wrong product as long as its rated for diesel or “C” (commercial) and in the recommended viscosities but there are better and worse. Well that's fun, marketing is a strong influence on preferences. There are way more brands than there are refineries to make the oil. From Ace Hardware to Ford everyone seems to have a "Brand" an anecdotal reputation and a committed customer following. Many, like Ford, have their own spec # but it backs into and uses as a base the API spec. API has specs and grades for oils that manufactures brand. Manufacturers meet or exceed that spec and all use that API relationship as a baseline for quality. So think of it along this path. I really like MY oil because it comes it a neat bottle and its purple, or green, or has a high tech sounding name or has a gimmick sales approach but WOULD I really actually buy it if on the back it was written "Does Not Meet API Specifications" for your engine? It's not magic Pixie juice, it's an Engineered product. Use those man/years to your advantage and check and rely more on API Engineered specifications than brand marketing. Meanwhile, saying that all oils are alike is akin to saying all batteries are alike because the majority are made by Johnson Control. Its an oversimplification that simply is not true. Here is a link to the Petroleum Quality Institute of America. Its full of Engineers that have spent their man-years researching petroleum products in the marketplace thinking there were differences between those products...they will no doubt be grateful to you for saving them any further wasted effort in their endeavors. No where did I write that "all oils are alike", in a rush to prove me wrong in some way you must have imagined it, only that the appropriate API spec oil is the base used for judgment, for instance current CK-4 API spec right on the container for consumers to easily see, AND, that some oils by manufacturers are rebranded, same oil in a different brand container. As long as it meets the CK-4 API Spec which includes the previous "C + Ascending Alphabet Number (s) it meets the specification for that particular oil use oil regardless of the branding, and that's just a fact. So, I would use AND RECOMMEND JUST LIKE API DOES any oil with that API current CK-4 Walmart Brand, Tractor Supply brand, Rotella T-4 and others even Delvac.